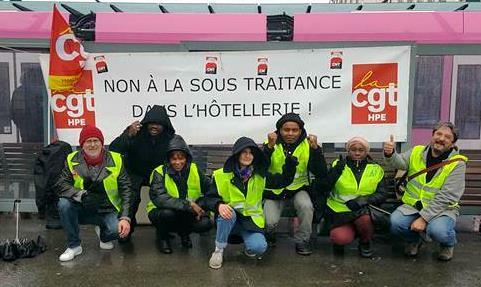 The workers who clean the rooms, wash the dishes and perform other outsourced low wage tasks at the 4-star Holiday Inn in Clichy, France have been on strike since October 19 last year. On January 20, they brought their struggle to Geneva and the parent company Intercontinental. A delegation of strikers accompanied by representatives of the CGT hotel workers affiliated to the IUF picketed the Geneva Intercontinental with the support of the IUF secretariat and the IUF's Swiss affiliate Unia to denounce the brutal working conditions imposed by Holiday Inn's subcontractor Héméra and deliver a letter to Intercontinental management. The strikers are demanding direct employment with Holiday Inn, an end to piece rates, an hourly wage and defined working hours, an end to unpaid overtime and the right to elected union delegates, among other demands. In the course of their struggle they have demonstrated in Paris, Barcelona and Brussels.